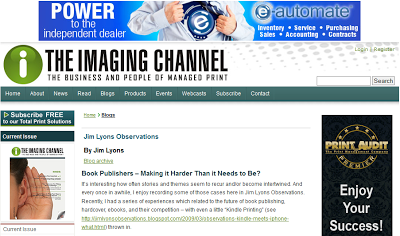 June 2013 Observations - Book publishers – making it harder than it needs to be? It’s interesting how often stories and themes seem to recur and/or become intertwined. And every once in awhile, I enjoy recording some of those cases here in Jim Lyons Observations. Recently, I had a series of experiences which related to the future of book publishing, hardcover, ebooks, and their competition – with even a little “Kindle Printing” thrown in. Since beginning this column at the end of 2005, I’ve tried to balance past, present and future, in looking at printing and imaging. While my viewpoint is a cultivated attempt at objectivity, I really am a “homer” when it comes right down to it, with a rooting interest in both worthwhile traditions and technology-based changes, at least if they represent an improvement over the status quo. For example, I love hardbound books, but can see the tremendous value of ebooks, including benefits of superior note-taking and referencing, and have been a proponent of electronic documents (of most kinds) for many years. So a recent experience, where I found myself seeking a well-known, traditional publisher’s permission to share a chapter of one of their recent works with the students in my undergrad economics class, left me wondering about hardbound books and their future. Are those in charge anachronisms, resting on their laurels, making things harder on themselves than they need to be, and even hastening their demise? I will keep this a bit anonymous, and simply describe the book in question as a major hit among the political prognostication crowd (see a recent Amazon screen shot of stats, below, for a view of its popularity and a hint to its identity). It is authored by an increasingly well-known individual who shares his surname with that of a precious metal. (The publisher shares its name with a monochrome flightless bird.) The book was published in Fall 2012 (I had it pre-ordered), and after reading most of it in hardcover, I also purchased it in ebook format, for the complementary benefits I mentioned above. There is one chapter about economics forecasting that I thought would be fun to use in my economics classes, offering a bit more of a pop-culture approach to one of the mysteries of macroeconomics. As a rather new higher-ed faculty member I had never approached a publisher to gain permission to use their material in the classroom, so I figured it would be an interesting experience. I also thought that this exposure of their book in the classroom, via a sample chapter, would be a good thing for the publisher, marketing-wise. I was pleased that the publisher offered a website for applying for such things, and I applied for the permission, supplying details like which pages (which can get a bit ill-defined in an ebook) and how many chapters I was interested in sharing with my class. I waited for an email reply, and was surprised when a letter (i.e., snail mail) arrived, almost two weeks after my request. In the envelope were two copies of a two-page contract, granting permission to share the material with 10 students for a fee of $40. Keeping in mind this didn’t include copying expense (which was executed by me, printing screen shots of my Kindle version), it seemed quite high, considering the students could acquire the entire hardbound book for just over $15, and the ebook for $12. One signed contract was due to the publisher in New York, with the other to be returned with a check to their Chicago office. (Wiring the money was offered as an option as well.) My university was ready to pay this for me with the use of a P-card, but no “plastic” (let alone PayPal!) option was included in the contract verbiage. I proceeded with a call to the publisher (amazingly, a name and number for an individual in the Permissions department was provided), but I got an abrupt “what does that mean?” when I asked about a more “user-friendly” way to pay (this after being informed that there was no way I would be remembered for my request, as they have so, so many of these). “Ah, a credit card … well I guess we can do that …”, and then I supplied the usual info (card number, expiration date) over the phone. After imposing (or feeling I had) on this abrupt, clearly “too busy” individual by making my payment, I had a further question, but barely dared to ask. It was along the lines of, “If a have another class …” (which I will have, many in fact), and I was informed that yes, indeed, each of these permission requests needed to be done separately, starting from scratch. In the end, my students received their copied chapters, and we will be discussing the reading in an upcoming class session. And as far as future classes? I will find some similar material to share with my students, via TED talks, online articles, or in our university library, but with the cost, and especially hassle factor of working with this well-known publisher, I can’t imagine ever undertaking a publisher permission request again. A check with a long-time publishing industry employee confirmed, as I suspected, that the practices and policies I encountered were not out of the ordinary. 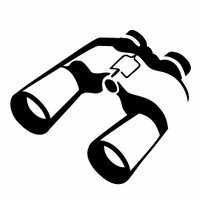 It was suggested that many publishers have outsourced all photocopy requests to the Copyright Clearance Center (CCC), but an after-the-fact check showed that while my “monochrome flightless bird” publisher manages some permissions through the CCC, those for academic requests are not among them. This was all for an economics class, but in terms of (negative) examples of understanding and satisfying user needs, promoting your product, and coming off as a likable, with-the-times partner, this story will come back many more times — only in my marketing classes! News came from HP last week that Executive Vice President Todd Bradley, manager of the company's Printer and Personal Systems (PPS) unit, was being re-assigned to a new position, EVP of Strategic Growth Initiatives. His replacement, Dion Weisler, comes from within the PPS organization, and has previously managed that unit's APJ (Asia Pacific and Japan) region. Interestingly enough, part of the new domain Bradley's new responsibility includes the China market, leading some to see this as a "swap" of responsibilities. And though the release from HP ("HP Announces Leadership Change in Printing and Personal Systems") includes the Printer unit in its headline, the change as interpreted by the reporter/analyst community as CEO Meg Whitman's effort to get some life back into PC business, with HP printers currently sailing on a relatively calm waters, under the combined leadership of Senior VP's Stephen Nigro and Pradeep Jotwani, who will now report to Weisler. résumé includes stints with Lenovo and Acer, more known for their traditional PC industry presence. One could extend this to the idea HP, not currently a significant player in mobile, is happy to "stick to their knitting" and stay away from this fast-growing segment of the business. But that's, again, making too much out of historical facts that don't really come into play when looking to the future. Paper envelopes in trouble - blame Congress! HP Celebrates 40 Years in Boise!